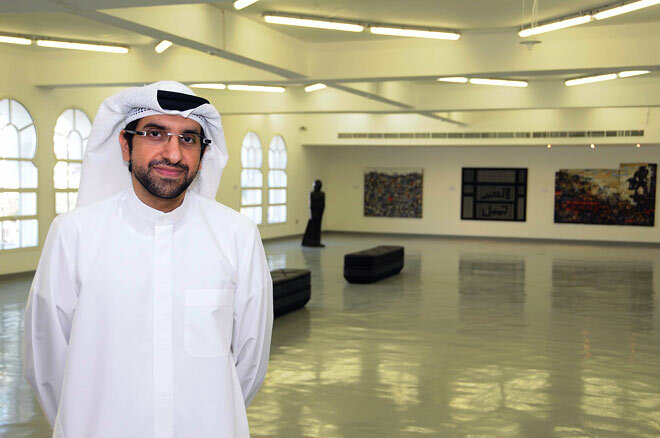 Interview with Sultan Sooud Al-Qassemi about his art collection and new foundation in Sharjah. Haupt & Binder: When did you discover your passion for art? When did this passion become an active collecting, and how would you characterize the focus of your collection? Sultan Sooud Al-Qassemi: Growing up in Sharjah, UAE, afforded me many opportunities to be exposed to various cultural activities due to the emirate's vibrant arts scene. Among these were the Sharjah Art Biennial, the annual book fair, as well as various additional art exhibitions. In fact, as a result of its support for culture, education and the arts, Sharjah was recognised as the very first 'Arab Cultural Capital' by UNESCO in 1998. As a student of the American University of Paris in the mid-1990s, furthermore, I was privileged to visit many world-class museums and art galleries, despite focusing my studies on business. What I discovered during this time was the existence of specialised museums that expressed stories not only of the collector but of the cause that he or she was championing. Many collectors used museum spaces to depict where their beliefs lay – and I was keen to follow in their footsteps, albeit with a distinctly Arab flavour. This was a guiding motivation behind my art acquisitions in the years that followed. Haupt & Binder: Why did you decide to establish a Foundation? What is the role that you envision for the Barjeel Art Foundation in the context of the art scene of the United Arab Emirates and the region? Sultan Sooud Al-Qassemi: I always intended to showcase my personal art collection once I deemed it had reached a sufficient size and calibre. An opportunity arose when the development authority of the Al Qasba district in Sharjah generously offered to host the collection for a period of time. Al Qasba is a cultural centre that lies between two demographically rich and diverse population bases in Sharjah and Dubai. The Barjeel Art Foundation intends to showcase the very best in modern and contemporary Arab art. Some of the pieces in the collection have been exhibited in Al Qattan Foundation and the Saatchi gallery in London, amongst others. Barjeel Art Foundation is the first private art foundation in the UAE whose primary aim is to exhibit and share works created by Arab artists living in the region and in the Diaspora. The UAE art scene is very dynamic, Dubai alone witnessed the opening of more than two dozen galleries in the past few years including Meem, a gallery that I co-founded with Mishal Kanoo and Charles Pocock. In fact Meem was the first and only art gallery to be awarded the Sheikh Mohammed Bin Rashid Patron of the Arts Award in March 2010. Coincidentally, I also received a Patron of the Arts award on a personal capacity for contributions to the UAE art scene during that ceremony. Haupt & Binder: In March 2010, Barjeel Art Foundation opened an exhibition space in Al Qasba, Sharjah. How does it operate? Is it a space to display your collection, or will there be exhibitions by guest curators and guest artists as well? What kinds of activities are planned? Sultan Sooud Al-Qassemi: The Barjeel Art Foundation is part of the newly developed Maraya Art Centre at Al Qasba – a dynamic space that encompasses three levels, each with its own vision and goal. The first level is an interactive community workspace called Shelter; the second level is the exhibition space for the Barjeel Art Foundation; and the third level is a space dedicated to the exhibition of works by emerging artists in the region. Central to Barjeel's vision is the creation of an interactive backdrop for Arab artwork included in the collection to be viewed and appreciated. The foundation strives with its space to forge a platform for critical dialogue about the arts. A foremost goal of Barjeel has been to give the artworks in the collection greater public exposure; Making the space accessible for people to come and view a selection of art in rotating exhibitions seemed to be the ideal starting point. We have hosted numerous tours for visitors, including students, faculty, tourists, curators during Art Dubai, and just recently the consul general of Japan, the ambassador of Austria to the UAE, and the President of Christie's Europe and the Middle East. Our next step is to welcome schools, universities and cultural institutions to use the space for critiques, seminars and discussions about contemporary art, and hopefully incorporate interactive visits to the space as part of their curricula. We also would like to circulate the artworks both regionally and globally by making them available to local and international exhibitions, displays, fairs, and art programmes. We have already committed to providing pieces from the collection on a loan basis to exhibitions in Abu Dhabi, Berlin, Stuttgart, Morocco and Miami. Haupt & Binder: What is the main focus of Barjeel's inaugural show, "Peripheral Vision"? As anatomical term, peripheral vision denotes the ability to see objects and movements outside the center of vision. How does this title metaphorically refer to your concept and intention? Sultan Sooud Al-Qassemi: The definition of peripheral vision was key to the concept of our first exhibition and articulated the regional themes, stories and struggles we felt each artist tried to examine in his or her artworks. These contemporary works look at issues such as cultural hybridity and how Arab identity is in a constant state of transformation. We want to show how art of the Arab world is nuanced and in a constant state of transformation and renewal. We wanted to expose different aspects of social, political and geographical landscapes that may be obstructed and out of focus. Haupt & Binder: Looking back at the last decade, what would you highlight in terms of what has happened in the art scene of the UAE, and the region in general? Sultan Sooud Al-Qassemi: Although the art scenes of the emirates of Abu Dhabi, Dubai and Sharjah have always been vibrant, I have noticed that they have become more daring in the past decade with regard to the quality and content of the works displayed and exhibited. Artwork tackling a variety of relevant issues, including human rights, women and gender roles, and children's rights have appeared at various exhibitions across the UAE. Other cities in the Arab world, including Bahrain, Beirut and Cairo, have also witnessed a revival in their respective culture scenes via festivals and art exhibitions. Independent initiative. Exhibits the contemporary art collection of Sultan Sooud Al-Qassemi in curated exhibitions. Investigating modernism in the Arab world 1950s-70s. Barjeel Art Foundation, Sharjah, UAE, 11 March - 22 Nov. 2013. Photos and curatorial introduction.